I’m always inspired by how other moms organize their time, especially with lots of little ones under foot. I love hearing the practical break down of another mom’s day. So, in keeping with that spirit, I want to take you on a tour of my homeschool day. I have four little boys and I’m seven months pregnant with boy #5. My boys are 6, 5, 4, and 2. 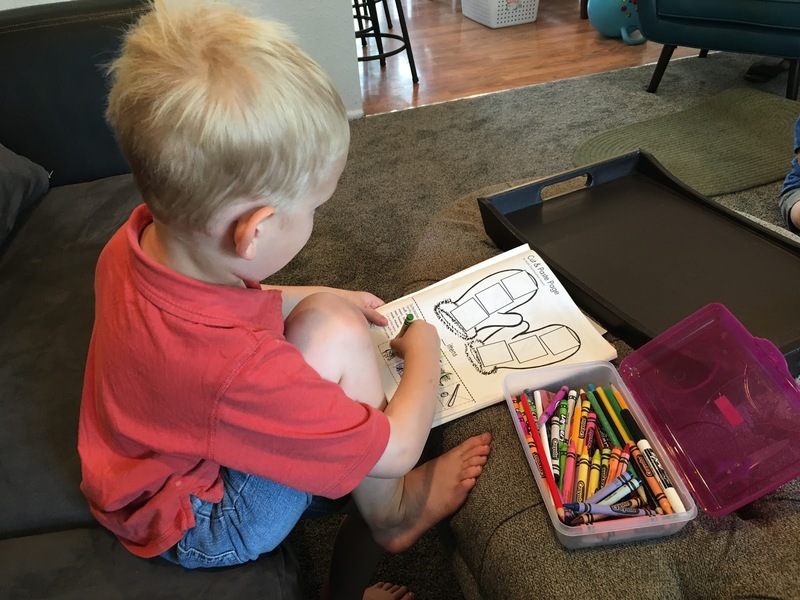 My 6 and 5-year-old are both doing second grade and I’m doing preschool/kindergarten with my 4-year-old. This is purely based on their personalities. 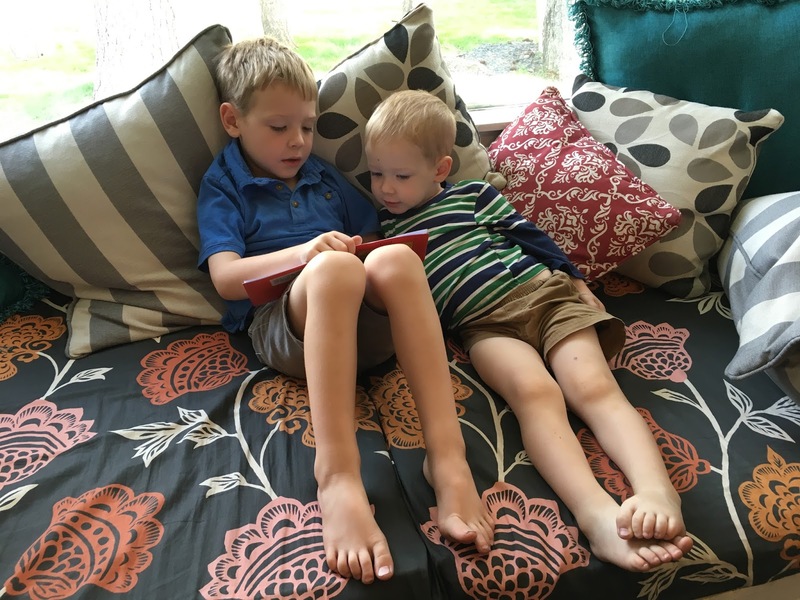 The 5-year-old wanted to start preschool with his big brother when he was only 2, and he hasn’t missed a beat since. Every kid is different. Child #3 really wasn’t ready for school until he was 4. This year I’m not doing anything specific with my 2-year-old. This post is primarily about how our day plays out. 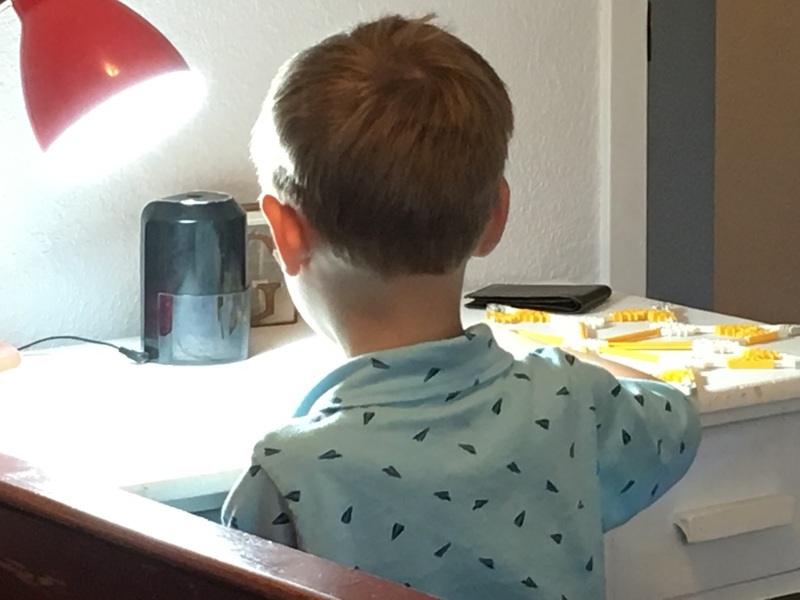 I don’t go into the details of our homeschool curriculum here. If you’d like to see what curriculum I chose and why, check out my VIDEO!! 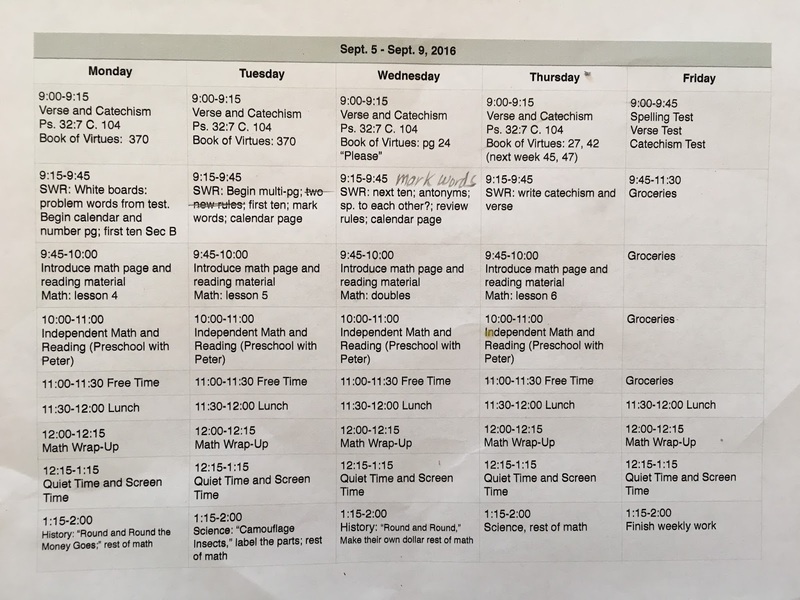 The details might be hard to see, so let me explain: I broke each day into time slots and I wrote the school subject or activity in each spot. I love this planning system. This template stays the same every week. The only things that change are the page or lesson numbers, which I type in over the weekend when I do my lesson planning. I don’t plan months in advance. I like the flexibility of taking it a week at a time and structuring our school work around how the kids are doing. If I don’t finish something on the schedule, I circle it and add it again to the next week’s schedule. We basically do school from 9:00-11:00am and then again from about 1:00-2:00pm. The kids’ time is still very much scheduled in between. They have their regular rest time, screen time, play time, etc. at the same time every day. This gives me time to get everything done that I need to do in order to keep the household running. 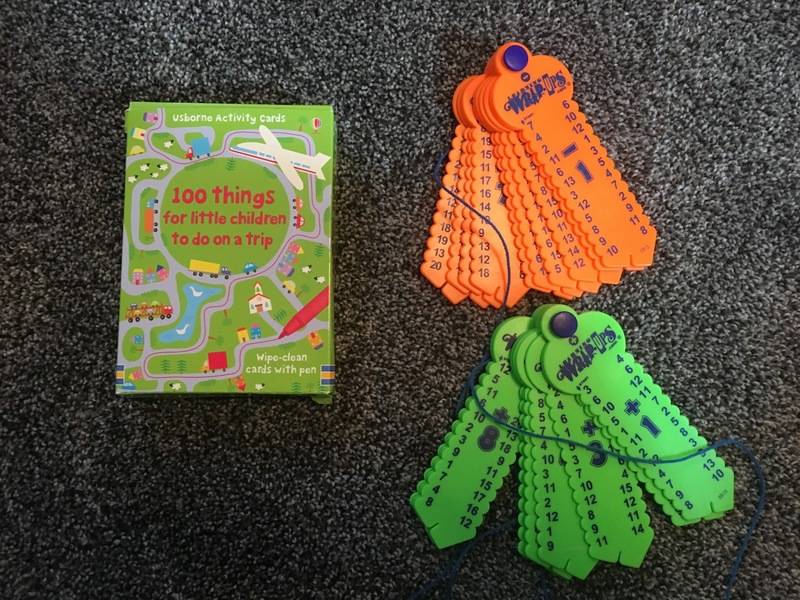 I give the kids a timer to help them keep track of their time and to know when to move on to the next thing. We are all up between 6:30-7am. Since school doesn’t start until 9am, it gives me a chance to accomplish household tasks. I will often do my Bible reading while I have breakfast, after the boys are done and off playing. Then I clean up breakfast, put away the clean dishes from the dishwasher, start a load of laundry, make my bed, get myself “presentable” (I’m glad that has a very broad definition), make my husband’s lunch, and get the kitchen table ready for school. The kids play until they hear the bell. 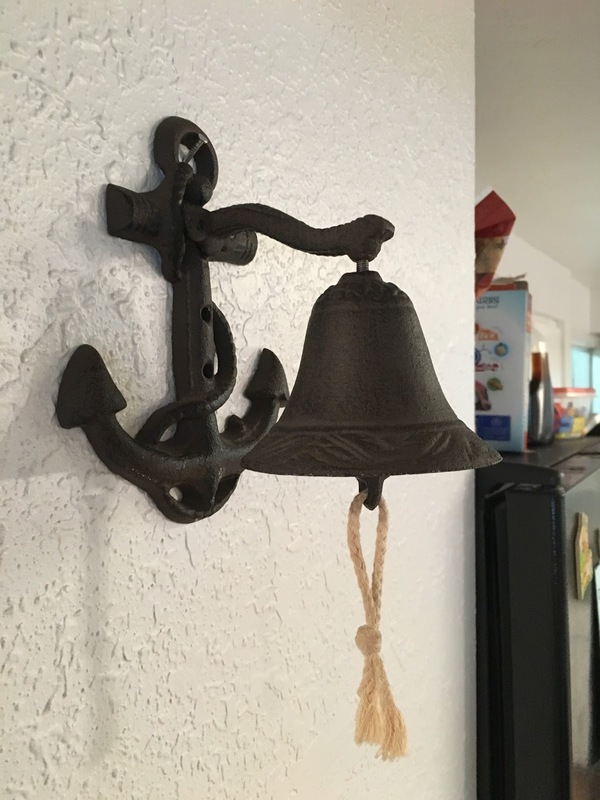 Yes, a literal bell. I ring two bells in the morning – one at 8:30am and one at 9:00am. The first bell is the “Job Chart” bell. The boys run to the chart and do their four morning prep jobs: brush teeth, get dressed, make bed, clean room. Cleaning their rooms is important because that’s where their desks are. I like them to do school in a tidy environment. Everyone participates in the job chart, even the 2-year-old. I don’t hold him accountable for a neat bed or a perfect bedroom, but I want him to start getting in the spirit of things. He watches his brothers and tries to copy them. If he’s still running around in jammies by the time school starts, I don’t sweat it. I just want him to make an attempt at the job chart each day, no matter how small. They each have a black box with their names on it (I love my label machine!!!) They usually only need their pencil box and their notebook. 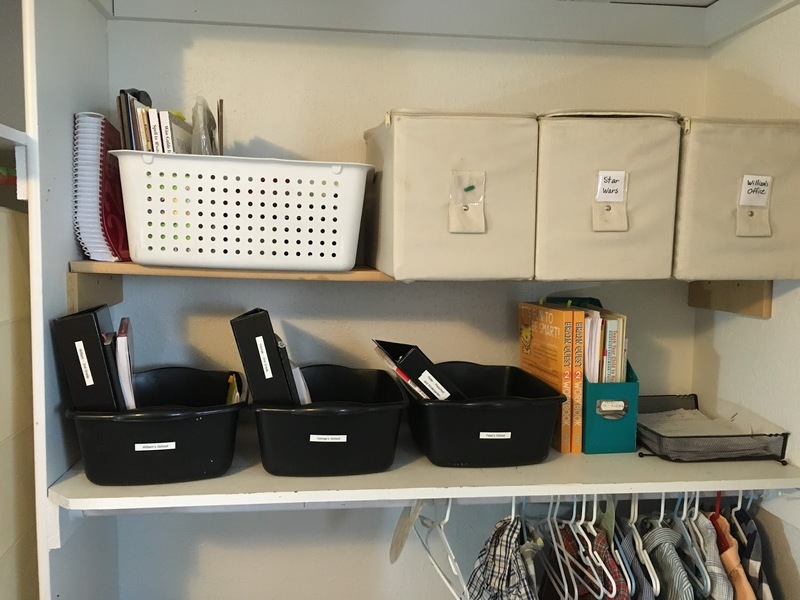 This is a great system for organizing their things. They keep their AWANA books in there, as well as their large binders where we organize their “finished” work. The bin on the far right bottom is our “turn-in” box. I use this for finished work that needs to be filed in the binders. The white box on top is mine. I grab that whole box and take it to the table each morning. I didn’t get a pic of us all sitting around the table, but here is a pic of the aftermath. 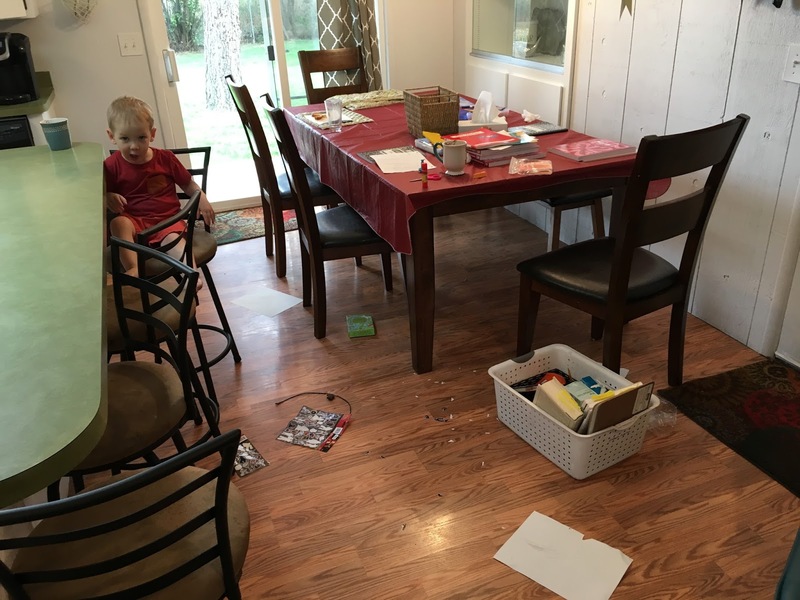 The 2-year-old has a guilty look on his face because he stuck Star Wars stickers all over the wood floor. As soon as Bible time is over we move on to language arts. We are using “Spell to Write and Read.” This is when I dismiss the two little ones to play quietly and I work with the older two until around 10am. This curriculum requires 100% of my involvement right now in the beginning. At 10am I spend a couple minutes explaining the Saxon math lesson. I also mark the next chapter of their “Sing, Spell, Read, Write” reading books and I send the older two to their desks. They can choose to do math or reading first. When they read they must read out loud, so they are allowed to move to another room for that. I often have a big one read to a little one. It helps keep the little ones busy. I don’t sit and listen to their reading. They can come to me if they get stuck on a word. While the big kids are doing reading and math I do preschool/kindergarten with my 4-year-old. 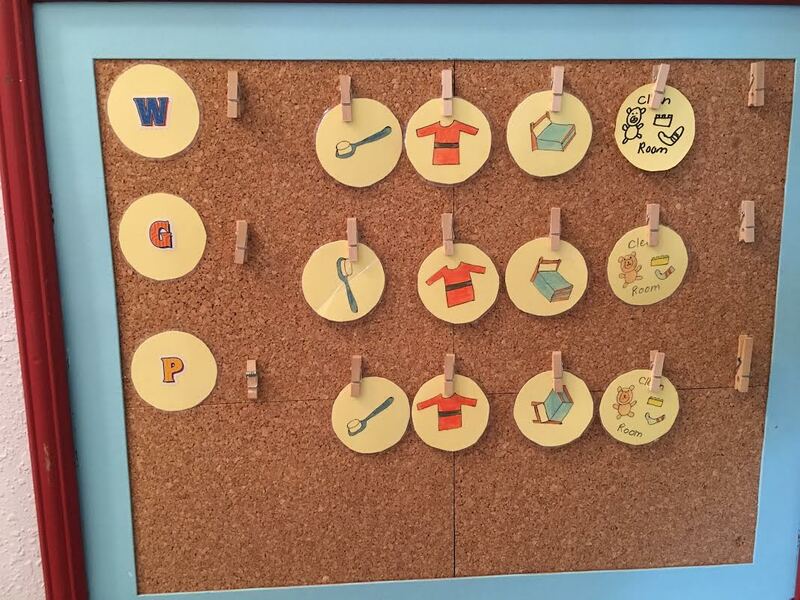 We are going “Sing, Spell, Read, Write” for his alphabet workbook. I also have a stack of number, color, shape, and letter workbooks from the dollar store. We read counting and alphabet picture books together. Some days we go over his ABC flashcards. The big boys finish around 11am. They play until lunch time at 11:30am. After lunch they head to their quiet time activities and I do home stuff. I clean up the kitchen and load the dish washer, do the next phase of laundry, answer emails, and prep dinner ingredients. Shortly after 1pm we’re back to school. At this point the 2-year-old is napping. We alternate in the afternoons and do history one day and science the next day. This particular day we were classifying products that came from plants or animals. I have my preschooler join in if we are doing an experiment, reading a picture book, or watching a YouTube clip. Then I send the older two off with their worksheets and he goes back to his quiet time play. After history/science, they big boys do the other side of their Saxon math page. Since the back of the math page is additional practice from the first side they did in the morning, they are able to do this independently. They are usually done for the day by around 2pm. This is when I send them outside with a snack (or down to the basement to play when it’s cold outside). This is when I make myself an iced coffee and work in another chore, like cleaning a bathroom, vacuuming, or sweeping and mopping. By 3:30 I am starting dinner. We usually eat between 5-5:30pm. If you have to excuse yourself to change a diaper, discipline a toddler, or save someone from hurting themselves, hand your big ones something to keep their hands and minds busy. Otherwise it’s hard to get their attention again. Flashcards would work, or even a blank sheet of paper that they can practice their memory verse on. These are the types of ammo I keep in my big white basket. I involve the little ones as much as is convenient, like when we do Bible or story time. But when it’s time for them to go play, we made a rule that has helped since the first day: You may not play in a room where someone is doing school. This applies to the big kids, too. If someone finishes their work early, they can’t just sit down and start playing if another brother is in the same room working. School time is protected. The benefit to having lots of little ones is that they keep each other entertained. 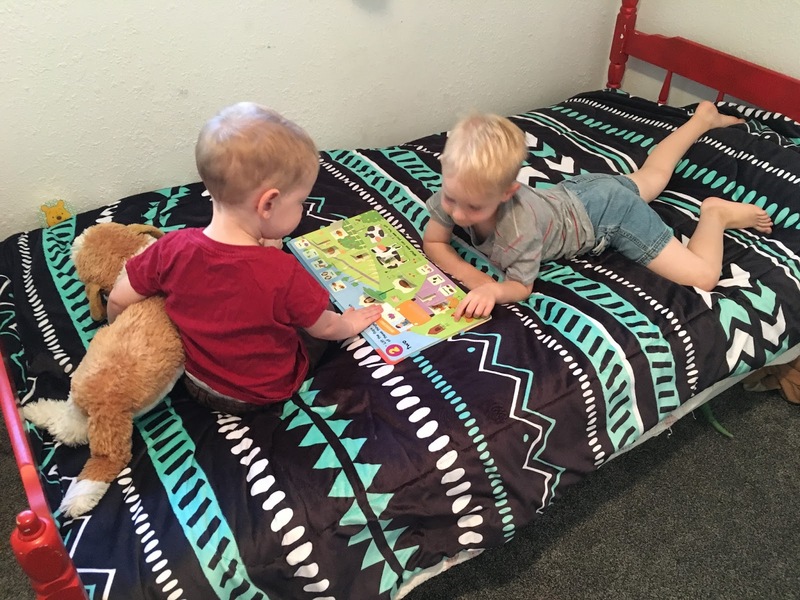 At first my 2-year-old did not like being sent away from me when I was teaching, but now he finds his brother and they play and read together. I also give the two little ones a snack shortly after our Bible and story time. 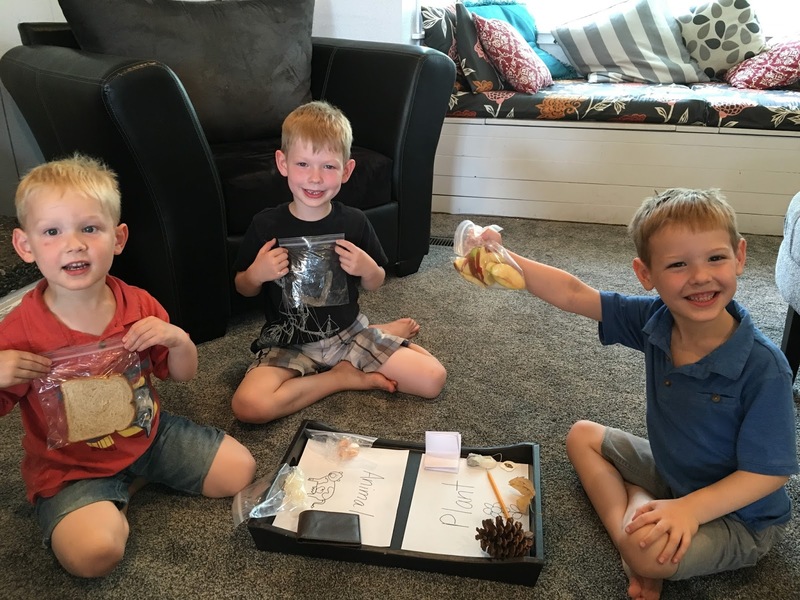 They take their little bowls of Cheerios and play in a bedroom while the big boys do school. Don’t forget to check out my VIDEO about our curriculum this year. I hope you have a GREAT school year!! 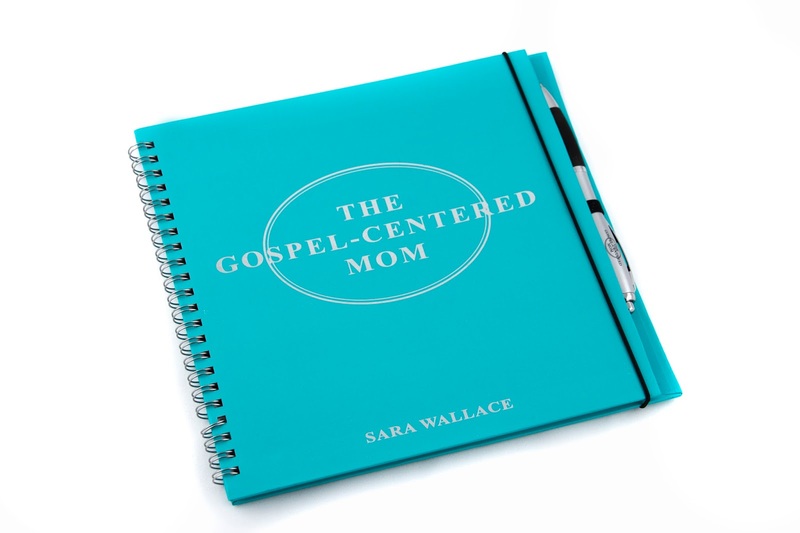 Sara Wallace is the author of “The Gospel-Centered Mom” Bible study. Get your copy on Etsy! I love seeing inside your home school day. Thank you for sharing. We are a north Idaho home school family of 5 too. 4 boys and a little girl to be added this February. It helps me see how other moms do it with little feet around and know that I am no alone in this. We're all doing it together for our families in different ways. Thank you for sharing! I thought you might like to know how I (at age 60+) came upon your site. A FB friend of mine, who is a missionary in Honduras, shared your article on contentment. She and I both homeschooled our offspring some years ago. However, I have never outgrown my love of all things related to education. So, after reading your lovely post about contentment, I saw your tab entitled Homeschool and had to see what you included. 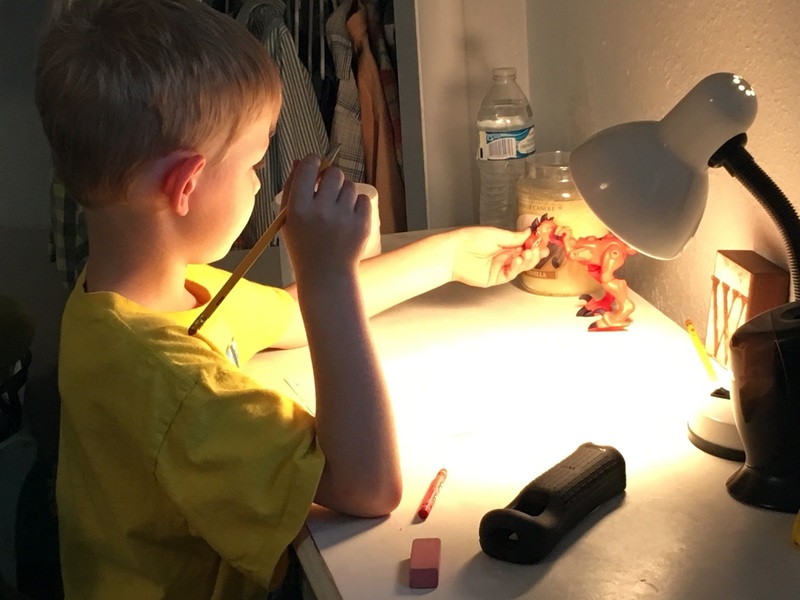 I never tire of hearing about homeschooling experiences. Now, I will share with someone I know who is currently homeschooling for the first time. Sharing how you organize your day will definitely help others. Thanks! BTW, after being homeschooled from 2nd to 12th grade, my son earned a chemistry degree and is currently working in that field. Blessings to you and your family.